The Text features in PCStitch are awesome! You can enter letters, words, or phrases to your own creations as easily as typing on your keyboard. Text is dropped into your patterns as objects. This means you can re-select it and modify it at any time. Change the size, color or even the font! Any TrueType font installed on your computer can be used to add words and phrases to your designs. TrueType fonts are the same fonts you use in applications such as Microsoft Word. Simply select the font you want to use, and the height of each letter. Select the area where you want to insert your letters and start typing. PCStitch converts your keystrokes into stitched letters. 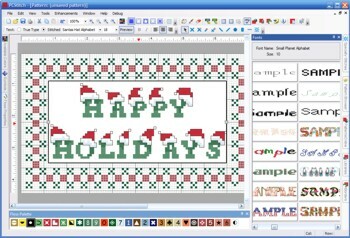 Stitched Fonts are alphabets that are created specifically for cross-stitch. Each letter in a stitched font is designed using any of the available stitch types. You can even use different colored floss or beads. 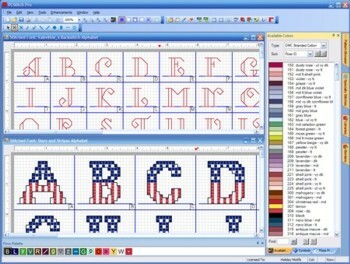 These alphabets can be simply backstitch letters, or extravagant letters using all the features of PCStitch. Using Stitched Fonts in future patterns is as simple as picking your starting position, then keying letters on your keyboard. Creating stitched fonts with PCStitch is a snap! Just "Draw" each letter within it’s sized area. Fonts can be setup to use the colors in the font or the pattern where they are used. For example, in the American Alphabet shown here, you would want the letters to drop using the red, white and blue flosses. 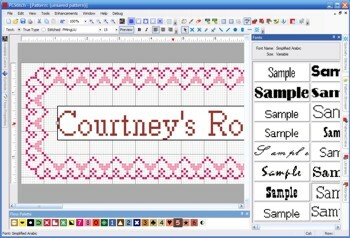 But, with the backstitch font, you will want to use that with any floss color in your new designs. PCStitch lets you do both! Over 100 Stitched Alphabets are included!